ART & ANTIQUEFEST: This event was created to increase awareness of our region's artistic heritage and antiques shops. 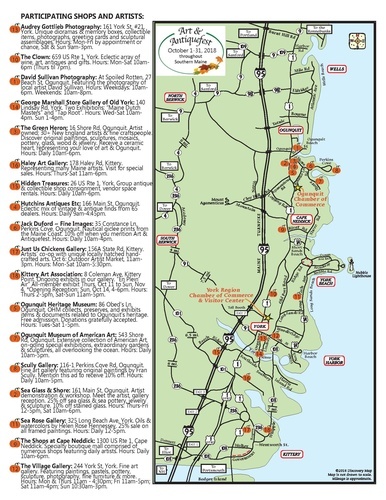 Visit participating galleries, museums and shops for great deals on art and antiques throughout southern Maine. Click here for a map of participants. Presented in conjunction with the York Region Chamber of Commerce. Audrey Gottlieb Photography: 226 York Street, 2nd floor, York, 03909: Unique dioramas and memory boxes, collectible items, photographs and greeting cards and sculptural assemblages. Hours: Monday - Friday by appointment or by chance, Saturday & Sunday's 9 am - 3 pm. Kittery Art Association: 8 Coleman Ave, Kittery Point, 03905: Ongoing exhibits in our gallery. "En Plein Air" All-Member exhibit Thursday, October 11th through Sunday, Nov. 4th. Hours: Thursdays 2 pm -5 pm, Sat/Sun 11 am - 5 pm, *Opening Reception: Sunday Oct. 14th 4 pm - 6 pm. Ogunquit Heritage Museum (OHM): 86 Obeds Lane, Ogunquit, 03907: OHM collects, preserves and exhibits items and documents related to Ogunquit's Heritage. Hours: June 1 - Oct. 31; Tues. - Sat 1 pm - 5 pm. Locations vary. Please see description to the left. Days open and hours vary. Please see description to the left.